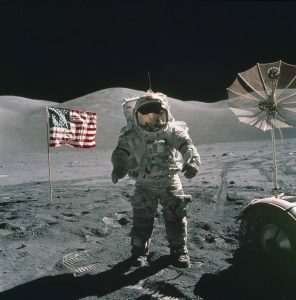 I was working in Sydney, Australia, on the day of the first Moon landing. Every department store window had a television in it, as did business offices which faced the streets. People were packed in everywhere trying to see Neil Armstrong & Buzz Aldrin ON THE MOON!!!!!! It was an incredible feeling of accomplishment. Sat up early one morning watching Apollo 13 make it’s safe journey back to earth–relief. 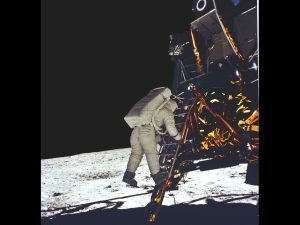 A few years later I raced home from a class to witness the final lift off from the moon–spectacular. So many great moments in between and unfortunately some sad ones too–Apollo 1 and the two shuttle disasters. Hopefully we’ll get back up there. I Am Generation Space. As I sat on my grandmother’s bed, home sick from school, I was eleven years old and happy to at least be watching Challenger take flight on January 28, 1986. 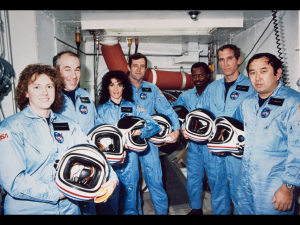 I had been following Judith Resnik and Christa McAuliffe during their training. Well, as much as I could before the internet was a thing at home. Challenger lifted off and then it happened. That moment will forever be with me. Something is not ok. Major Malfunction. They were able to make it, right? That plume that went to the side, it has to be them. With all of the hope an eleven-year-old could possess, I wanted them to be found safe. I watched John Zarella on CNN, tangled with typewriters and confusion, a voice I grew up with, hoping he would bring better news. There would not be better news, only footage of wreckage and a glove. That glove. August 1987, my mother made a dream possible. She dropped me off in Huntsville, Alabama, for a week at Space Camp. It was an amazing week complete with a simulated shuttle mission where our group took best mission, earning us a silver Shuttle pin and my Wings. For a girl from Wisconsin, this was a pretty big thing and an honor to have been in the buildings that the very astronauts that inspired me had been. Fast forward to 2016. Now a widow, my daughter and I moved to Titusville, Florid, for a much-needed change. The night we arrived was a ULA launch to the International Space Station. The perfect way to be greeted to our new home. 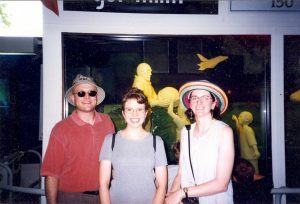 We went to Kennedy Space Center Visitor Complex that week and I knew this is where we belong. I turned a corner and there it was. Challenger. You see, I wasn’t into all that space stuff like my sister. I wasn’t paying much attention when the shuttle program was gearing up. Still, I was being raised to be a future news junkie. Thus, my first real Gen Space moment was all of us in mom and dad’s bedroom on the morning of April 14, 1981. I was sitting on the king size bed in my jammies waiting for the first shuttle to land. I can’t remember for sure, but I think we must have been watching Tom Brokaw and John Chancellor on NBC because that was the station our antenna received the most clearly. When Columbia finally touched down, I thought, “It’s just a really fat airplane. People will be be able to take an airplane to other planets.” That was such an exciting idea! Later, in July of that year, Charles and Diana were married. Anna and I stayed up to watch it live. To me, the wedding was a lot more exciting than the shuttle landing. Today, I see things differently. 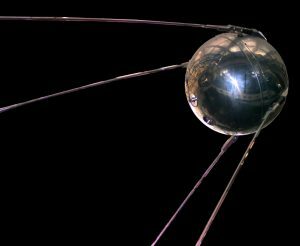 I love little Sputnik, even if it only has a few toothpicks left. Charles and Di’s marriage didn’t last. But the allure of space lives on with talk of landing people on Mars. 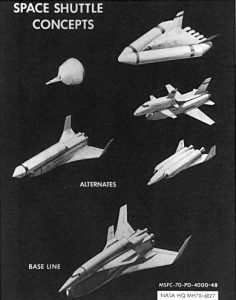 I grew up with beautiful glossy posters of the space shuttle looking down at me from my bedroom walls. My father had taken our family to a science teacher’s convention, and I was mesmerized by the NASA booth. The people seemed to know everything. They answered all my little-kid questions about space, showed me all kinds of cool gadgets, and sent me home with all manner of space shuttle posters. This is the future, they said, and I marveled at it all. 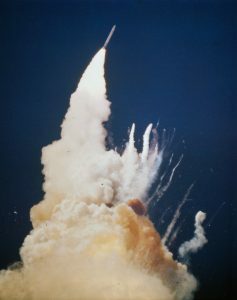 I was a sophomore in high school when the space shuttle Challenger exploded. Someone came into the classroom and whispered to our trigonometry teacher and then left. She took a minute to gather herself before she told us. The sudden, violent loss of Challenger and its crew made it clear that reality was not a glossy poster. Gleaming white machinery could turn into grey flame and black ash, taking the best and the brightest down from the heavens as it fell. The future changed for me that day. 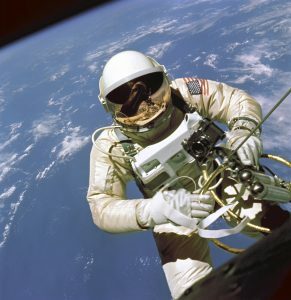 If delays hadn’t occurred, Shepard would have been the first human in space. He wasn’t. 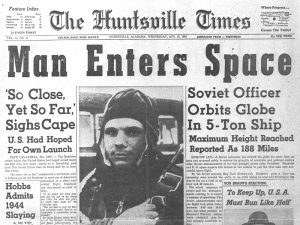 Instead, during those delays, Yuri Gagarin flew to space on April 12, 1961, less than a month before Shepard. 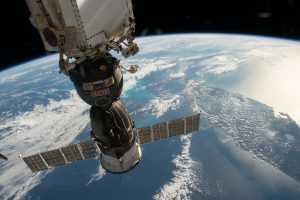 The Soviet Union beat the United States in the Space Race—first with a satellite, then with a man. I visited the Soviet Union as a college student in 1986, shortly after the Challenger space shuttle accident, the Chernobyl nuclear power plant accident, and my father’s death from cancer at age fifty-three. I was twenty-one years old, on the cusp of adulthood, the same age my mother was when she watched Shepard’s flight in that upside-down year: the numbers nineteen and sixty-one are upside-down images of each other, and the year became topsy-turvy with Cold War tensions. Eleven shuttle missions occurred while I was in high school and three more during my first semester of college (1981-1984). With each mission, Shuttle opened space travel to more kinds of people. That didn’t start right away. On April 12, 1981, the STS-1 crew consisted of two white men who had been born in the 1930s and had served in the Navy: John Young and Bob Crippen. 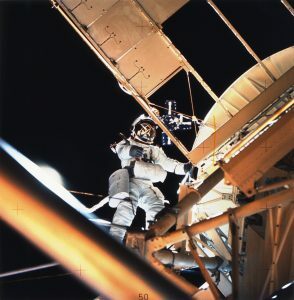 By STS-5 in November 1982, though, the crew included two mission specialists—Joseph Allen and William Lenoir—and the program was overtly thinking more broadly about who was best suited to do what in this long-term effort. These excerpts are adapted from Generation Space: A Love Story. Available at Amazon, Stillhouse Press, and elsewhere. I truly am Generation Space! 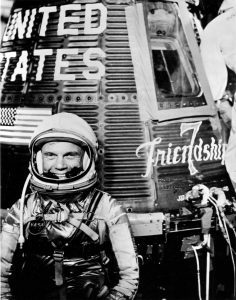 I watched John Glenn become the first American to orbit Earth. 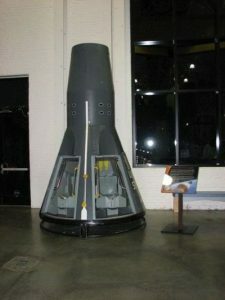 I tasted apple sauce from a food tube like those that astronauts ate from and peeked inside a Mercury capsule that was touring the United States. I told my grade-school principal that I wanted to be an astronaut when I grew up. She reminded me of this many years later when we served on a youth symphony board together. I mourned three astronauts that were killed in the Apollo 1 fire. I stayed up late, practically all night, celebrating the first Moon landing and completely filled a scrapbook. I worried for days as Apollo 13 made its way back to Earth. My co-workers and I wore aluminum foil hats and had party the day Skylab crashed in 1979. I was on maternity leave with my first baby, feeding her and watching live TV when we lost Challenger. I celebrated the first woman in space (missed my chance!). I’ve been fascinated by the spectacular images from Hubble. I never did become an astronaut, but I’ve read my share of science fiction and watched lots of Star Trek. What a wonderful time to exist! The space shuttle program was as much a part of my childhood as watching the Smurfs on a Saturday morning. For a while, it was equally as routine. 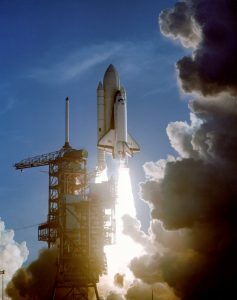 On mornings when a shuttle was launching, my dad would wake me up early so we could see it together. We would sit in the living room of our apartment, in our robes and bleary-eyed, and watch another crew fly toward the heavens. Shuttle landings lacked the spectacle that appealed to my young sensibilities, but my dad watched them with equal intent. Some things, I didn’t appreciate until later. Like millions of children across the country, I watched the ill-fated Challenger launch from the familiar setting of my school classroom. Our teacher was absent, but we were just as keen to see Christa McAuliffe and her fellow astronauts under the watchful eyes of our substitute. Within moments of what looked like an explosion, the school counselor was in our class of third- and fourth-graders asking if we had questions. I was too stunned to ask anything more than how? The dangers of space flight had never occurred to me. The early morning launches were simultaneously awe-inspiring and matter of fact: this is who we are and what we do, we send explorers into space. “Manifest destiny” taken to the stars. These days, I spend quite a bit of time talking with my son about the universe and sharing these bits of wonder from my childhood with him. At the age of three, he described his piggy bank as “gibbous”; we have run around the outside of our house to watch the International Space Station travel across the night sky; and his was the voice who told me that “they found more planets around another star” when the Trappist-1 system was announced. All this makes me think wide-eyed wonder might be a genetic trait. I cried when Challenger broke apart (I was in 5th grade) and I was nerdy enough for Jean Luc to repeatedly tell me that space was the final frontier. But I was never captivated by space, or science in general. My disinterest became disdain as my high school and college science courses brought long study nights and lowered my grade point average. We learned constellations and where to find Venus in the sky. We studied ancient types of telescopes and early astronomical findings, and I finally understood a little bit of the wonder and yearning that space holds for so many. Before I heard Neil deGrasse Tyson talk about the Cosmic Perspective, my daughter Audrey had already given me a version (in reference to the futility and overall insignificance of tween boys). She will be (The Next) Generation Space, and she will boldy go where no ONE has gone before. When I was in second grade, our local bookmobile came to our school, and I found this book about space. I remember it had a red spine and a picture of Ed White walking in space on the cover, and I read it and was hooked. 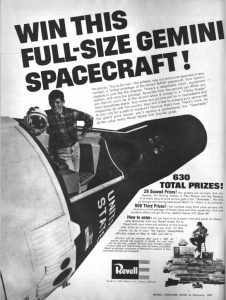 I have been a space geek since. I was glued to the TV for Apollo 11. I was 10 years old and it was summer vacation and I was inside watching the launch, the moonwalk, and the splashdown.